A CUP OF steaming hot coffee can rejuvenate the tired soul of any coffee lover. But no instant coffee can match the aroma and flavour of freshly roasted coffee beans, and this is something Delhiites cannot boast of. There is no enterprise in Delhi that roasts its own coffee, according to Kajal Ghosh, assistant secretary of the government-run Coffee Board’s Connaught Place unit. The India Coffee Centre, located in Connaught Place and run by the Coffee Board, is the only government-owned retail coffee shop open to the public. The tiny shop was once a popular choice among coffee lovers for the freshly roasted coffee. But that was six years ago. The roasting process, which took place in the open, resulted in smoke and pollution and was opposed by neighbouring offices. Since then, the centre has been sourcing roasted beans from plants in Bengaluru. Today, it only grinds and packages its coffee in Delhi. Premium coffee enterpriseslike Dewan’s or Lavazza sell pre-roasted and packaged coffee, with a shelf life of almost a year. This reduces its freshness, taste and aroma. This shortcoming, however, turned into a business opportunity for coffee afficionados Matt Chitharanjan and his wife Namrata. The couple moved to Delhi from Chennai two years ago. They soon realised how difficult it was to get freshly roasted coffee in the capital. “We would get it in Chennai around every street corner, at every kiosk. But Delhi has no coffee culture to speak of,” says Chitharanjan. It is their craving for good quality coffee that made them launch Blue Tokai Coffee in January 2013. The experiment to start their own coffee brand began when Chitharanjan, a former researcher with the Institute for Financial Management and Research in Chennai, visited the best coffee estates in south India with his wife. They met coffee growers and experimented with different varieties of coffee beans. After careful selection and tasting, they shortlisted green beans produced in seven estates in the Nilgiris and in Hassan, Coorg and Chikmanglur districts for their venture. Three of these estates are organically certified. What makes Blue Tokai special, besides their wide selection of brews, is the company’s promise to ship the customer’s choice of coffee within 24 hours of roasting,so that it is delivered fresh. Most of its coffee is shipped to retail stores in Mumbai, Bengaluru and Delhi, with which the company has tie-ups, as well as to individuals. Blue Tokai has witnessed a boom in business within two years. Set up with an investment of a little over `20 lakh, the company today has grown into a self-sustaining unit. Its sales increased from 2.5 tonnes in 2013 to 7.5 tonnes in 2014. 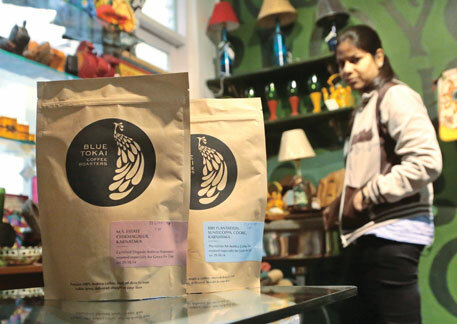 Blue Tokai Coffee charges between `300 and `350 for 250 gm of roasted coffee beans and powder, much higher than `100 per 250 gm sold by the India Coffee Centre. But the latter is not organically certified. Chitharanjan says his is a nichébrand whose product is highly priced, but this is not too much for the discerning coffee drinker. Challenges, however, remain. “Since our coffee is already highly priced, we had to find other ways to cut costs, like negotiating better shipping rates,” Chitharanjan adds. Banking on the demand for organic, other companies are also wooing their customers. Kerala-based Inheritance India promises organic coffee to the health-conscious coffee lovers. Its coffee is sold under the retail name Re Forest Gourmet Coffee. The company works through subscriptions. Most of its customers are reached through word of mouth and email. The pure Arabica variety is sold at `1,400 per kg, twice the price of Dewan’s Arabica roast. But the high price does not cover the cost of growing coffee organically. Lygia Mathews, one of the directors, explains that the gap is compensated by the carbon offsets generated by afforestation initiatives that are integreted with the venture. Organic tea is also catching up. 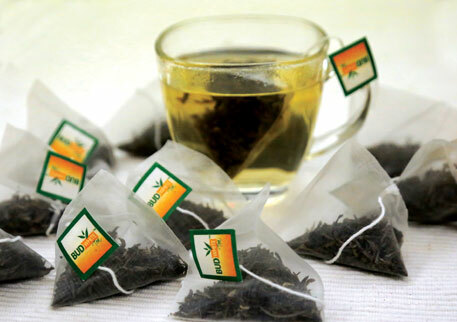 Bud White Tea, a premium tea brand, was launched in 2013 by Sanjay Gupta, who hopes to combine his passion for tea with the tremendous business opportunity in the sector. All of his tea is sourced from certified organic farms in Darjeeling, Nepal and Assam. Most of it is supplied to retailers, but almost 20 per cent of the sales come from online shoppers. What differentiates Bud White Tea from the other retailers is the form of tea. Unlike others, Bud White Tea is sold as the whole tea leaf and not as powder. “We have specially designed tea bags to accommodate the whole leaf so that it expands when dipped in hot water,” Gupta says. He currently supplies over 40 different varieties of tea, including black, green, oolong, white, herbal and flavoured. While most premium, non-organic whole leaf tea is sold at `3,500-`4,000 per kg on an average, organic tea costs almost 40 per cent more, he says. of urban India is not simply a question of health, but also of changing tastes. And new businesses have gone out of their way to cultivate the taste buds of their consumers with innovative marketing strategies. 3 Windows Cafe organised a brewing brunch last year so that their customers could interact with the Blue Tokai team and learn about roasting and brewing practices. Bud White Tea organises tea-tasting sessions and tea parties as requested by customers and even has a tea-brewing guide available for download on its website.